This week, our statewide museum tour moves into Central New York. In recent years, the region has been gaining a national reputation as "Brew Central," thanks to its hops producing heritage and the resurgence of craft breweries and other beverage producers. The good cheer is complemented by a copious crop of museums, many of them nationally known and one-of-a-kind. 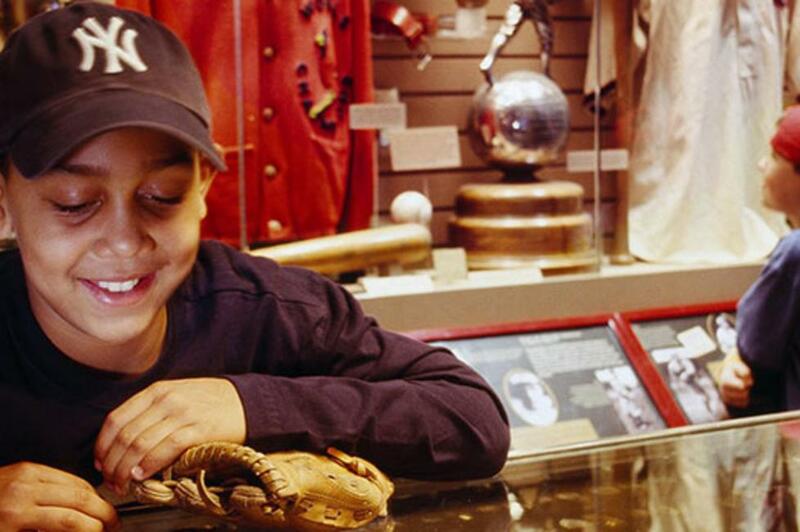 When I was eleven, my father and I walked through the National Baseball Hall of Fame and Museum in Cooperstown. Being a young fan, I was awed by the place, but what I really loved was that my father felt exactly the same way. That day, we spent more time on his enshrined heroes than mine. It was the first time I ever saw my father as a former boy, just like me. Over the years, the Hall has been reconceived as a more colorful, modern museum experience. But recently as I stood in the admission line, I watched four different fathers wrangling eight excited kids all dressed in their hometown uniforms. It seemed to me not much has changed. Baseball still binds the generations-in so many ways, the Hall of Fame is the glue. The Fenimore Art Museum, on the site of author James Fenimore Cooper&apos;s early 19th century farm house in Cooperstown, houses the impressive collections of the New York State Historical Association, with fabulous examples of fine art- including Hudson River School canvases, and folk art full of imagination. The museum&apos;s Thaw Collection - one of the nation&apos;s leading exhibits of American Indian art and artifacts - amply demonstrates the aesthetic power of American Indian art through the beauty and artistry of more than 800 objects. The Farmers&apos; Museum, across the street from the Fenimore, is a place where a family can easily spend a full afternoon immersed in the life of a 19th-century working farm and historical village, complete with a County Fair and the glorious Empire State Carousel. Demonstrations, livestock and a treasure trove of historical objects help make the rural life real. It&apos;s only open for special events in the winter, but plan a trip for spring. Fort Stanwix National Monument in Rome is an important relic of several colonial wars. Designed in the shape of a four-pointed star, the fort was constructed by the British in 1762 and reconstructed in 1974. It&apos;s like a time machine, seeing the military arms, clothing, hardware, Indian artifacts and furnishings from the French and Indian War and the American Revolutionary War periods that take you back in history. For additional museums in Central New York, click here. Named for the long narrow lakes that spread like fingers, the Finger Lakes region is home to over 100 wineries and vineyards. Its historical legacy is equally bountiful, having been a national center of the abolitionist movement and the birthplace of the women&apos;s rights movement. 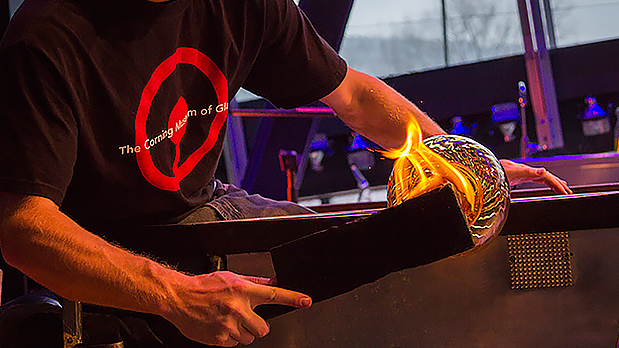 Corning Museum of Glass is one of the most extraordinary institutions in the nation. Architecturally stunning, artistically sophisticated and truly engaging, this museum makes utterly transparent the indispensable role glass has played in our civilization. More than a dozen galleries illuminate the 35-century long history of glassmaking, and the Contemporary Art + Design Wing, opened in 2015, features breathtaking exhibits by some of the edgiest artists in the medium. But this is also a museum that works, in a practical sense. The several "Hot Shops" on the grounds are dynamic, entertaining studios where glassblowers fashion original pieces for audiences of all ages. Book ahead on the website for a chance to "Make Your Own Glass." I can hardly wait for next Christmas when I hang my new, fab glass ornament. I blew it! The Rockwell Museum houses an impressive collection of art and artifacts - more than 3,000 pieces - including 19th-century Native American artifacts, great paintings and bronzes of the American West, illustrations and works on paper. You&apos;ll also find artistic works from post-war America, photography and arms and armor. The original collection, amassed by local business owners Bob and Hertha Rockwell, focused on the American West but, forty years later, the museum has expanded its purview to the entirety of the American experience. The Women&apos;s Rights National Historical Park in Seneca Falls was the 1848 site of the nation&apos;s first women&apos;s rights convention, where it was shockingly declared that "woman is man&apos;s equal." Visit the Elizabeth Cady Stanton House here, then follow the Votes for Women History Trail west to Rochester, where the National Susan B. Anthony House takes you into the private world of this public woman. The Strong National Museum of Play in Rochester, with exhibitions like Pinball Playfields, American Comic Book Heroes and Toys Hall of Fame, make for a museum that&apos;s full of goofy, childlike fun-but with a scholarly side too for those who take play seriously. Talk about a museum that&apos;s great for kids - but even I had to sidle up to the Sesame Street stoop-and swoon. Ah, youth! The Eastman Museum in Rochester is an absolute must for anyone who loves taking (or looking at) photographs and movies. On the grandiose estate of George Eastman, the man who made Kodak a household word, in a restored, Colonial Revival masterpiece of a house with glorious gardens, is a leading museum of the industry, craft and art of photography and cinema. It is home to the personal collections of Cecil B. DeMille and Martin Scorsese, and the archives of the Technicolor Corporation. Try to schedule your visit around a film screening at the on-site Dryden Theater. For more museums in the Finger Lakes region, click here. Next week, we go west, young men (and women), and end our tour in the Greater Niagara and Chautauqua-Allegheny regions.